Raw and vegan trends meet in this unique baking book from a popular blogger. 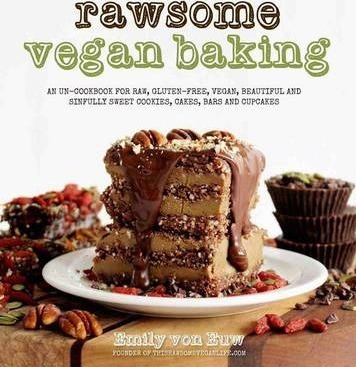 Whether you're a vegetarian, a raw vegan or even a meat-lover just looking for something healthy, new and delicious, Emily von Euw, creator of ThisRawsomeVeganLife.com, has provided 100 creative recipes for delicious raw, vegan treats that are easy to make and beautiful to the eye. Emily's eye-catching recipes like her Red Velvet Mousse Towers, Loco Coco Bars and Lemon Cream Pie with Pecans are so tasty that you won't even realize they're vegan. With Rawsome Vegan Baking you'll wow your taste buds and your waistline. Emily von Euw is the creator of the blog This Rawsome Vegan Life, which gets over nearly 1 million views a month. Emily's blog won The Vegan Woman's 2013 Vegan Food Blog Award, was named one of the Top 50 Raw Food Blogs of 2012 and is nominated for `Favorite Blog` for the 2013 VegNews Awards. Her recipes have been featured on Shape.com, SkinnyLimits.com and AscensionKitchen.com. Emily lives in British Columbia, Canada.